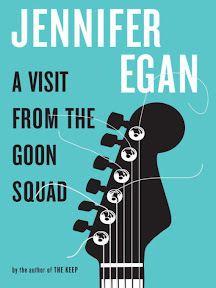 A Visit from the Goon Squad [Book Review] – my books. my life. I would really like to devote this whole review to the power point chapter. Amazing. How Egan packed that much emotion into some simple slides is beyond me. You NEED to read this book, if only for that chapter. But the rest of the book is definitely worth reading. The story moves from character to character with an effortless and subtle ease that all of a sudden you are 6 layers deep in the story and you had no idea you’d gotten that far. Rather than focus on a few main characters and only touch on some periphery ones, Goon Squad gives everyone a say and is a richer book for it. I kept expecting it to go back to Sasha and Bennie and it kept straying farther away. But it still remained their story. And the people in their lives. The detailed stories of so many characters weave together yet contrast in a way that makes you see the possibilities in life. How one thing can change everything and how we all change in a million different ways all the time. The only real issue I had with the book, was the ending. It was…strange. I don’t want to give anything away but it got less lifelike in a book that felt so real prior to the end. But the powerpoint chapter? Totally makes up for it. Great review!!! I have read two chapters of this but then had to read some other books for review so I hope to return to this soon. I’ve enjoyed it so far and really want to get to the power point chapter LOL!! So many have loved this book. I am hoping to get the audio soon from the library. Thanks for the passionate review. Between this review, and Sandy’s I am coming to realize that this is not a book that I am going to be able to ignore. It sounds wonderful and also very unique, which is something I so desperately need right now. Thanks for sharing your enticing review with us. It’s only a matter of time before I have my own copy! Read it, loved it. I listened to it on audio, and if any of you want to go the audio route, don’t let anyone talk you out of it. The PowerPoint section WORKS, believe it or not. This will be on my list of top reads for the year. I loved this one too. I actually really enjoyed the ending (and the entire last chapter, which convinced me it was indeed a novel.) I agree the PowerPoint chapter was the most fascinating, but the final chapter is my favorite. Now I am curious about that chapter!! This is on my list to read sometime this year. I liked her other book (The Keep) quite a bit but it took me a while to realize this was from the same author. I go back and forth on whether I want to read this one. Part of me feels like there has been so much hype at this point that I will inevitably be disappointed. Thanks for the review! I really really really want to read this one and I am glad you enjoyed it so much, because now I’m justified in wanting to read it. I saved this review until I’d read the book for myself and I think we had fairly similar responses to it, although I read it in a highly distracted fashion and should have been a more attentive reader; I know I missed a lot, but I still love the way that the thread of time slips amongst these characters and keeps you engaged, even when you’re, necessarily, at a distance. So clever. A strange book, innovative and bold definitely, but I have to confess, having just finished it, that I didn’t really enjoy it. There were too many literary devices thrown in and the whole thing felt messy. Added to the fact that the characters felt very thinly drawn I lost interest very early on.